A tall evergreen tree used widely in street plantings, parks and gardens the Lemon scented gum is Corymbia citriodora (syn. Eucalyptus citriodora ). 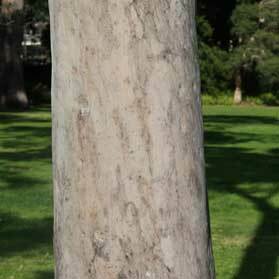 Reaching 20 – 40m in height depending on conditions and with an pleasant lemon fragrance its peeling pink / grey bark and attractive smooth trunk are added features. This is one of the all time favourite landscaping trees for broader commercial plantings where feature trees that add impact, yet light in are required. A quick visit to Monash University in Melbourne will show how dramatic these trees can be in the landscape. Wholesale Nurseries supply good sized trees ready for commercial landscape planting. Similar in appearance to C. maculata which does not have the lemon fragrance. Corymbia citriodora makes a great feature tree with its peeling pink / grey bark and attractive smooth trunk. C. citriodora ‘Pink Dwarf’ is a smaller growing cultivar to 7m while Corymbia citriodora subsp. variegata is another worth considering. Corymbia citriodora or Lemon Scented Gum can be used as a feature tree in a large garden. Corymbia citriodora is also used as a street tree in open situations or as a shade tree in rural locations. Common Name – Lemon scented gum. Height – To around 20 metres to 30 metres. Spread – To around 6 – 9 metres metre.